I must be feeling very spinny this week, I just seem to want to keep starting things. Instead of finishing my apple sourz spinning that I started last week, I decided instead to start on some BFL humbug top that i have had for ages, It was from Wingham I think. 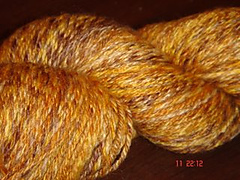 There was about 160g, so I decided to do a 3 ply, using 2 plies of this, and a single ply of plain brown BFL I had. Which is now fast becoming this scarf for Lee. I've also been doing a little spindling over the last couple of weeks, this is the Chameleon Colorworks BFL I bought at the socktopus opening, I'm about 25g in and it's (fingers crossed) going to be a self striping 2 ply laceweight. I split the yarn length wise into three, the colour didn't quite penetrate all of the fibre so 1 length was very deep colours and the other two had some whit running a long side each colour. I broke off each colour segment and spun it from the fold, resulting in 1 ply with very solid colours, and 2 plies that barber poled from taking from the colour and the white at the same time. 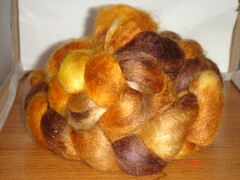 I plied the singles with a very controlled plying, inch worming to ensure that i maintained an even ply throughout. I didn't try to control the colours plying together to achieve a varigated effect which was helped along by the barber poling in the individual plies. Seeing as a couple of people have commented, meaning you are actually reading, I thought I better give you something pretty to look at. It's 3 ply, about 14wpi, and just under 100g. Now if I can only decide what to knit with it! And some of you have seen the half finished version of these, Hubby's hand spun socks, it's a cable plied corriedale, dyed with gaywool dye in rosemary. No idea what the wpi or yardage is on these, but he's happy, (so my life is quiet). This was my first time trying an afterthought heel, and my god was it terrifying cutting something I had knit, I thought I was going to pass out! And finally, this is some BFL, one of my early food colouring dying attempts, and yes it really is half red and half green, and kind of reminds me of apple sourz. Again it's going to be a 3 ply sport(ish) weight yarn. having been bugged by Nora at the Socktopus launch party last sunday, I have finally revived my blog. I don't know if I'll keep us with posting, but I can but try. I've got some ideas for some posts that might actually e interesting to other folks too, so we'll see how I get on with that. Anyway, I'm not used to all this any more, and it's tired me out, time for me to have a lie down I think. I'm so happy, I finally passed my Google adwords professional exam last week, and just to prove it, here's my adwords professional logo! How cool is that!